Beneficiary Entity | Sea4Us - Biotecnologia e Recursos Marinhos, Lda. 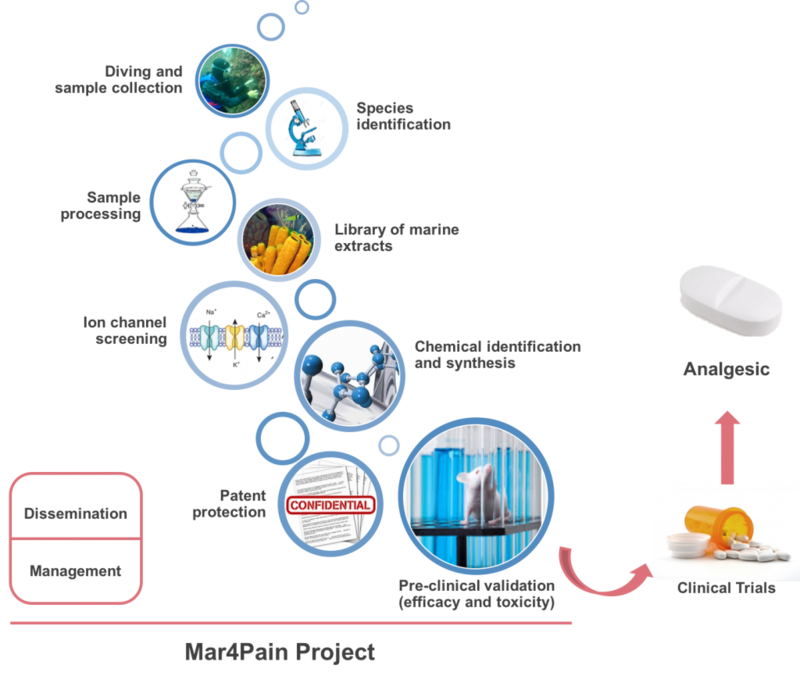 Expected / Obtained Objectives, Activities and Results | The main aim of the Mar4Pain project is the development of new pharmaceutical drugs through the investigation and use of new marine compounds for biotechnological purposes. It has particular emphasis on moderate to severe chronic pain, addressing the modulation of ion channel activity in small diameter dorsal root ganglion neurons. This will reduce the perception of pain by acting on pain-conducting neurons away from the brain, which considerably reduces side effects of usual therapies (e.g. opioids). The ion channel modulators consist of new molecules from marine sessile animals from the Portuguese coastal region, which have been discovered through Sea4Us's prior investigation. The expansion of our marine extracts/compounds library, bioactive molecules identification, non-clinical efficacy and toxicity tests, and industrial property registration, are all specific goals of the 2 year-long Mar4Pain project. Besides the allocation of a team within Sea4Us with strong competences in the field of the project, it also has the contribution of researchers from other R&D-specialized entities. - Improvement of the company’s research, development and innovation management. Progression of the Mar4Pain project is indicated in the figure below, which depicts some activities and goals.